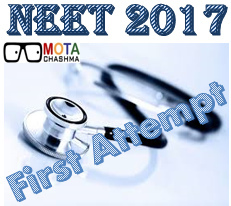 NEET 2017 will be considered as the First Attempt out of the the three as decided by the Council for the candidates appearing in NEET for the year 2017. NEET 2017 will be conducted as National Level Entrance Exam for Medical and Dental courses admission across the India, and there are only three attempts to be made by the candidates to clear it. NEET 2017 was introduced in 2016 and has replaced the AIPMT. NEET According to the notice and Information Bulletin released by CBSE for NEET 2017, it was mentioned that the candidates who have already availed permissible three attempts would not be able to apply for NEET 2017. 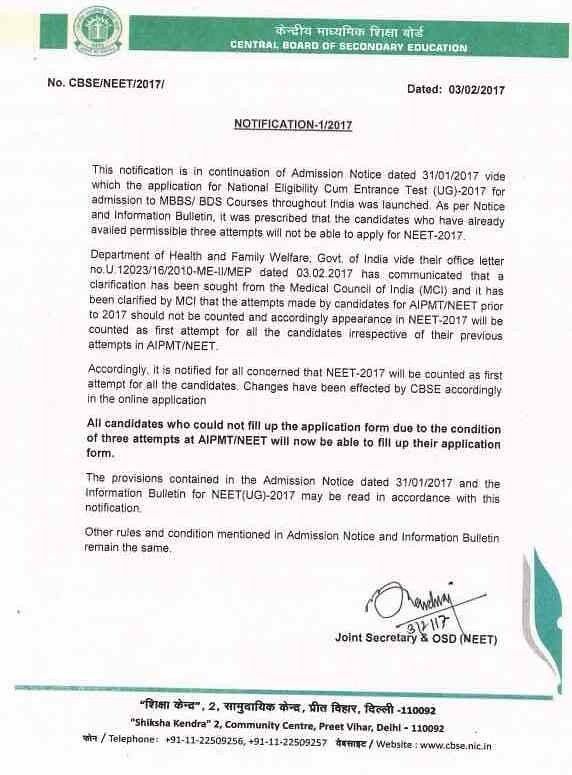 According to the current notice released on 3 February 2017, Department of Health and Family Welfare, communicated that a clarification has been sought from the Medical Council of India (MCI) and it clarifies that the attempts made by the candidates to appear in AIPMT/NEET before 2017 will not be counted, and accordingly the appearance of the candidates in the NEET 2017 will be considered as the first attempt for all the candidates irrespective of their previous attempts. CBSE has also made the changes accordingly in the online application form. All the candidates who were unable to fill the Online NEET 2017 Application Form previously due to the condition of three attempts at AIPMT/NEET, will now be able to fill their Application Form. The admission notice and the information Bulletin that was released for NEET 2017 remain all the same for other provisions mentioned in it except for the attempts to appear in NEET 2017.